Protea (Protea cynaroides) are flowering shrub-like plants widely distrubuted among the southern regions of Africa as well as Australia and New Zealand. The native range of Protea experiences wildfires that benefit the protea by returning the nutrients the protea has removed from the ground back to the soil. Protea regenerates from healthy buds located just below the soil line. Protea is most often grown from rooted cuttings, as only a small amount of the seed is fertile. The flower heads are unusual with several flowers located in the middle surrounded by colorful bracts. Choose a well-drained frost-free location in the garden to grow protea for cut flower production. Do not expect protea to survive a typical winter in North America without protection, although some varieties are more cold hardy than others. Protea are suitable for growing in containers in colder regions. Ask the representative where you purchase protea plants about the growing habit and cold hardiness of the protea you would like to grow. Proteas for cut flower production must produce upright stems at least 18 inches long. Protea that produce shorter stems are not suitable for commercial cut flower production, but are acceptable for personal use as a cut flower. Also, it will be difficult to protect a large number of plants that are not adapted to your growing region or USDA plant hardiness zone. Plant the protea in the chosen location without adding any soil amendments. Protea thrive in well-drained poor soil. Dig the hole twice the size of the root base of the plant to loosen the soil. 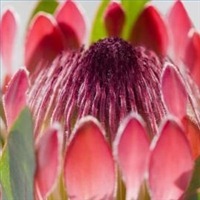 Plant the protea no deeper than it is planted in the container. Spread a 1-inch layer of mulch that consists of large pieces of bark, small rocks or pebbles around the root zone of the protea. The idea is to keep the roots cool, but not allow water to remain in the soil for a long length of time. Rock or bark mulch helps shade the soil while allowing it to drain. Water the protea when the soil under the mulch layer is dry, or every 14 days if there is no rain. Water by deeply soaking the root zone, then removing the water source. Do not allow the root base to become waterlogged for more than a few hours. If growing protea in a greenhouse, remember each plant may only produce a maximum of 18 acceptable stems per season and each plant can take up as much as 4 feet in diameter. The rest of the year there is no return on the space being used while you keep the plants alive under artificial conditions. Fertilizer that contains phosphorous can kill protea plants. Protea have a natural ability to find phosphorous in the soil.